Ambitious attempt: An artist’s impression of RTA-70, India’s new generation plane being designed by National Aerospace Laboratories. Bangalore: India’s space agency will be made a partner in the country’s Rs2,500 crore passenger plane project so it can share its technology expertise, infrastructure and programme management skills and help avoid the mistakes and delays seen in previous projects. The Indian Space Research Organisation, or Isro, “will be part of a consortium," said G. Madhavan Nair, chairman of the research council of National Aerospace Laboratories, or NAL, a public-funded agency focused on civil aerospace technologies. “NAL will lead the project." Nair, a former head of Isro, said the plane project would be run by an independent commercial body, with public and private partners, including an overseas aerospace firm. He did not name the private firms. The plane project is yet to get government sanction but is listed in the science and technology plan in the 11th Plan that ends in 2012. Once approved, the plane project will take around six years to build and be certified for operations, said C.G. Krishnadas Nair, president of the Society of Indian Aerospace Technologies and Industries, or Siati, a body that promotes home-grown enterprises in the aerospace and defence sectors. So far, India’s attempts to build civilian planes has had little success. NAL has built two civilian planes so far: Hansa, a two-seater trainer, is being flown in some flying clubs but is not a commercial success yet. Saras, a 14-seater plane project in the works for nearly two decades, has been suspended till an inquiry is completed into the crash of a prototype in March that killed two pilots. 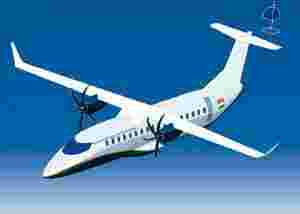 In the late 1990s, military plane maker Hindustan Aeronautics Ltd, or HAL, and Franco-Italian manufacturer ATR dropped a plan to make turboprop planes jointly in Kanpur, citing limited market opportunity. But economic growth since then and the boom in India’s civil aviation sector has presented a fresh opportunity to build planes locally. NAL officials say the sweet spot would be planes that can carry 70-90 passengers over the short haul (up to 1,000km, say, Bangalore to Mumbai) and does not compete with planes of large firms such as Boeing Co. or Airbus SAS. Currently, only NAL and HAL build planes in India. In December, Mahindra group become the first private Indian conglomerate to acquire the capability to build aircraft when it bought two Australian aerospace firms for up to Rs175 crore over five years. For the RTA-70 project, HAL is the manufacturing partner and firms such as Infosys Technologies Ltd and the local unit of US technology firm Honeywell International Inc. are building some technology components, Satish Chandra, convenor for the RTA programme at NAL, said in a lecture on 30 September. The plane is expected to consume around 30% less fuel than existing 70-100-seater passenger aircraft, and have half their maintenance costs through the use of special sensors and coatings. RTA-70 will be able to land and take off on small runways and use satellite navigation, Chandra said. “We should make use of all resources (in aerospace) within the country. The aim is to make the project a success," said Nair of Siati. In addition to building rockets and launching satellites, Isro is building a capsule to carry astronauts into space and later to the moon; some of the facilities and technologies it uses for projects such as these could complement NAL’s plane programme. NAL, too, builds and tests technology for Isro’s programmes. While Isro’s record of building rockets and launching satellites has improved over the years, it has seen its share of delays. The Geosynchronous Satellite Launch Vehicle, or GSLV rocket, with an indigenous cryogenic engine, was set for launch by January but has been delayed by at least a year. Analysts caution that Isro’s bag is full with projects, including planetary and manned space missions, and even if it is used as a partner, the lead agency should take on the onus of completing the project. “Why just Isro, you can use any resource available in the country, but the least you should do is to have one person or agency that should be accountable (for the project)," said retired Air Marshal T.J. Master, chairman of Master Aerospace Consultants (Pvt.) Ltd, an aerospace advisory. “It should be made a commercial success and that should be the drive."